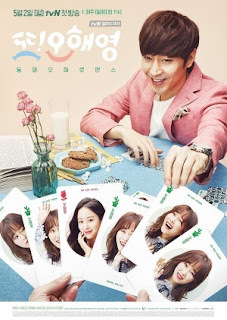 Cast: Eric, Seo Hyun Jin and Jun Hye Bin. Park Do Kyung (Eric) is a popular sound director, famous for his skills and temper. One year ago, he was dumped by his fiancé Oh Hae Young (Jun Hye Bin) on his wedding day: he then finds out that it was overheard that she is about to get married to someone else, and in a drunken frenzy decides to ruin her wedding, by ruining her fiancé. Sometime late he starts to see weird things: visions of a girl he had never met before. And as fate has it he bumps into her, and her name happens to be Oh Hae Young (Seo Hyun Jin). One day before her wedding, Oh Hae Young was dumped by her fiancé. Embarrassed by it, she lies to her friends and family that she was the one cancelling it. Even though she gets criticized by everyone, she firmly keeps her story like that and pretends she is okay with it. The more Korean dramas I watch, the more I realize that they are quite the same. So, I kind of get why it is hard to come up with good drama plots. This drama though has something special about it. Not just the cast, but the entire plot is well thought of. It has a surprising element which doesn’t make it a typical love story: which is the vision part. I know I didn’t explain it much in the summary, but it adds nice flair to the fantasy genre. Eric has never left me with a bad drama, but this one is probably his best yet. The two female leads are regular, though not bad. So, to sum up: a great drama with a good plot and good acting. I gotta say, did NOT expect this kind of drama. Reading the plot in the beginning, made me really hesitant about it, but I really wanted to see Eric’s drama. I started it with a mindset that I would drop it as soon as I lost interest in it. Now, I’m just too sad I won’t be seeing it the next few weeks. Yes, I loved it, it blew me away. The twisted plot, the explosive acting from the whole cast, the beautiful cinematography, yes, everything about it. What makes this stand out a lot, is how unusually the story unfolds compared to other dramas. It’s a rare jewel amongst all the other dramas there is. Yes, I’m looking forward to Eric’s next project! !